Oh wait. That wasn't one the choices. I have only been to one tractor pull and I was impressed with the thickness of the smoke. Looked like it couldn't have been cut with an axe. Robert B. I really don't understand what you are saying here. When the opportunity presents itself to get a reset while under a load, I will do my best to get the 34. If I can run 11 hour days for two days and reset, I jump on the opportunity. That usually has to be done before you are on recap. The biggest problem, for me, is I try really hard to not run to close to zero. Having nine hours on your 70 doesn't mean you can drive nine hours. You have to allow for traffic, construction and other possible delays. If you start with nine; drive for eight and a half and the next place to park is 40 miles away, it ain't gonna work. I will start this post with the original subject in mind. Werner does test hair. "Hair folicle" is misleading because the follicle isn't taken or used. Older Newbie, One thing that has stood out with me about Werner, is the number of people that come back after leaving. It is too early for me to say more, but as I gain insight, I expect I will be able offer more praise. The best of luck in your adventure. Two weeks notice or no? Rick laid out important considerations. I did not give two weeks notice. I took home time and cleaned out my truck. The day before I was scheduled to go back out, I sent a message I had cleaned out the truck and I was ready to turn it in to the company. Now since I was unsure if I would be out a day or a week, I did leave enough on the truck to get by until I was routed to a terminal on their time. They had me pick up a load and I was routed straight to a terminal, about an eight hours drive. It took me ten hours to pick up a loaded trailer at the shipper. Not the best experience for my last run with them. I believe the company was pleased that I just didn't leave it at some truck stop. I would have preferred to give more notice, but I was worried about getting everything off the truck and the new company was renting me a car to get to their terminal. I believe that two weeks is excessive. I do not believe the larger trucking companies can look two weeks out for planning of routes and drivers. If the company only has a few trucks then the owner might need time to line up a new driver. Errol, If you read the website, you will see that there is a CNG turbine used to charge the batteries. While it is an electric vehicle, it runs on Compressed Natural Gas. I don't see any information for PTL out of Alabama. I drive for PTL out of Murray, KY. They do hire from all over. Carl, Glad to hear things are looking up for you. I did not see PTL, Paschall Truck Lines, in the list of pet friendly companies. There is a $500, $250 non-refundable, deposit and then it is $10 a week. Normally, your dog would have to wait to be with you until you completed training. Since Cowboy is a licensed service dog, I am not sure how that would affect things. Pretty open question. You have one in mind? I got a pit on the truck with me. I couldn't imagine a better temperament. I really don't care for the yap dogs. He snoozes most of the time. I take him out for a bathroom break about half as often as I go. The cooler weather makes him goofy outside. It makes him act like a puppy. The shedding is terrible though. Getting the short hair out of the upholstery is a chore. Do i need a passenger endorsement to bring wife/ gf/ brother in truck? Jonun, You will need written authorization from the company you are driving for. Without that, there is a very large fine. 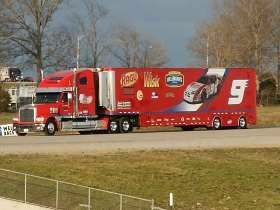 Will it still be a written test for Texas starting July 8, 2015, ....aren't there changes coming that will be effective on this date or will Texas still be taken a written test for pre-trip. Yes. That is correct. Written test only (static/applied air brakes test if equipped). Pre-trip / Air brakes written tests are super simple and easy. Just don't forget there is only one pre-trip test. Questions for a school bus caught me off guard until I looked at the picture. Oh, I had already answered a couple of questions before I realized each question had a picture beside it. I will second Old School. If there is any way your company can give you some practice time in a combination, go for the Class A! Even if you never use it, better to have it. I go to PTL orientation starting on May 20th.Is there anyone out there that has worked or is working for PTL at the moment that can give me an inside scoop? Welcome to Trucking Truth and PTL. You are going the same route that I did. I got my CDL at a community college. It wasn't TCC, but I have taken classes there. The motel ain't no Motel 6, but you won't have to worry about getting bounced out of bed while sleeping. There are waffles, bagels and cereal for breakfast. There will be a plate lunch provided at PTL. Evening meal is a voucher for the buffet at Sirloin Stockade about a block away from the hotel. There will be a driving test, but I think is more of a test to see if you have ever been inside a truck than a test of driving. I was there around Thanksgiving. All of the trainers were on their way home. The trainers pick the trainees, so don't be afraid to talk to someone you think might be a trainer. Have fun with it. PTL is the only place that I applied and I am pleased with my choice. If you have more questions, shoot me a message. I got my CDL through a local college using the G. I. Bill. Having your CDL in advance might give you more options. The company I drive for does not train to get the CDL. There are two phases to training. First phase is with a trainer for 5,000 miles. The second phase is teaming with another trainee for 40,000 miles. You are paid by the mile during training. During my second phase of training, I had to team. The planner pushed us pretty hard. I am not sure if that was because we were trainees or because they didn't understand HOS. More than once we received a pre-plan telling us to run as a team. Even with two drivers, the truck can't run 24 hours a day without doing a reset. Team money really comes in to play when both team members are part of the same household, husband and wife. Jeff. I went to orientation with PTL the week before Thanksgiving. I believe that I made a good choice. PTL operates primarily east of the Mississippi. There are two phases of training. The first phase is with a trainer and you are supposed to do five thousand miles. The second phase is with another trainee. As a phase two trainee, you will run as a team and you will see lots of California. Phase two lasts for forty thousand miles. If you have specific questions, I will try to get you the answers.